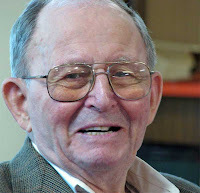 Ed Campbell passed into the presence of the Lord on Saturday, March 29, 2008 at the age of 95. We will have a memorial service for him on Saturday, April 5, 2008 at 10:00 a.m. at New Life Church Riverfalls. You can read more about his life in the Oregonian or the West Linn Tidings.